MIDI (Musical Instrument Digital Interface) is an established standard for control of modern instruments of diverse kinds, originally conceived for music synthesizer control. Musical events (like turning a pipe tone on or off, setting a register, etc) are invoked by MIDI signals, sequences of bytes, transferred in serial form over a single communication line. Such signals can be generated several ways, a most obvious one is using a 'master keyboard' where such signals come each time you depress or release a key. Using computers or special hardware such signal sequences can also be stored as computer data files. In this case each event is supplemented with information on when it occurs in time. MIDI files can be handled like any computer file, they can be generated or modified using suitable editor programs, and stored on various media. The regular way to control this organ is from MIDI files stored on 3.5" diskettes. The files are played back in a specialized MIDI player, Viscount RD-70. This device is a 'sequencer' that reads the diskette files and sends the control codes on its output line at the proper time instants. Alternately the organ MIDI can be taken directly from a master keyboard, or from a computer running a sequencer program. 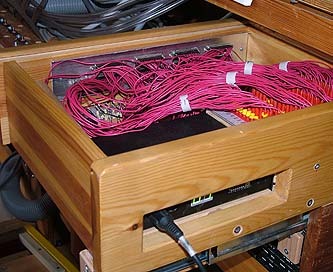 The MIDI signals to the organ are received by an Octet UM-1 decoder, the central black box in this photo. This device interprets the codes and has an output in form of 128 lines, one for each of the notes within one 'MIDI channel'. When a 'note on' command is received, then the line corresponding to that particular note is activated and will pull a magnet valve somewhere in the organ. The line stays active until eventually a 'note off' command for the same note is received. The 128 decoder outputs are drawn to jacks on a patchboard panel. The note valve control cables from the windchests are plugged into this panel. This is where the correspondence is defined for which particular note will be played by each MIDI note. The MIDI files are developed and edited off-line in a computer. The image below shows the computer display of a simple editor I wrote myself. In its main editing area you see a score with the 128 note positions going from left to right. Time, measured in bars, goes from top down. Immediately above the editing area is a hint of a keyboard plus a histogram showing the relative frequency of notes within the entire score. The bass, accompaniment, and melody chests are patched such that the notes played are the same as the nominal MIDI notes. But the span of 128 MIDI notes is far bigger than actually present in the organ. The remaining lines are used to control the register unit, the counter melody chest, the harp, and the drum machine. All with arbitrary transpositions, defined by how they are connected in the patchboard. The notations below the image tell how this is done presently. In the editing area 'notes' can be handled the conventional ways of an editor, like using the mouse for select, cut, copy, and paste operations. There are also a number of musically related commands, like transposition, speed and duration modification, channel assignment, etc. Special commands search for overlapping notes and too short gaps between consecutive instances of the same note.